The Herb Garden was designed by Carol Goodwin, faculty member, and built in 1994 by student, Leon Verdurmen, and Carol on the site of the old weed garden. It is laid out in a traditional "four quarter" design which predates medieval gardens. There are two quadrants with a blue/mauve/pink colour scheme, a white quadrant and a gold quadrant. 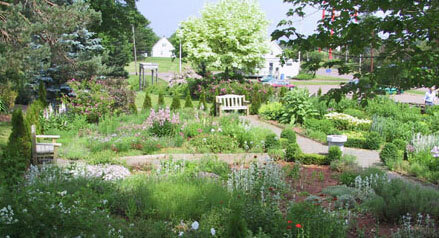 The garden is maintained by the Friends of the Gardens. If you would like to learn more about herbs, consider joining our group. The plants are a combination of medicinal and culinary plants, with some dye plants included. The sundial which serves as the centrepiece was an earlier class gift, and was brought to the rock garden as the most fitting place to display it. The wattle fence is traditional style, using local materials (alder branches). It was built by students in the Landscape Horticulture program (now called Environmental Horticulture) under the supervision of Robin Clarke. Robin was a campus employee at the time (1997). He is a skilled basket maker and created all of the woven ox carts, fences and baskets used in the creation of the film The Scarlet Letter. The benches were built by the landscape students in the class of 2002 as a class project in their Wood Construction Techniques class taught by Wayne Bhola.